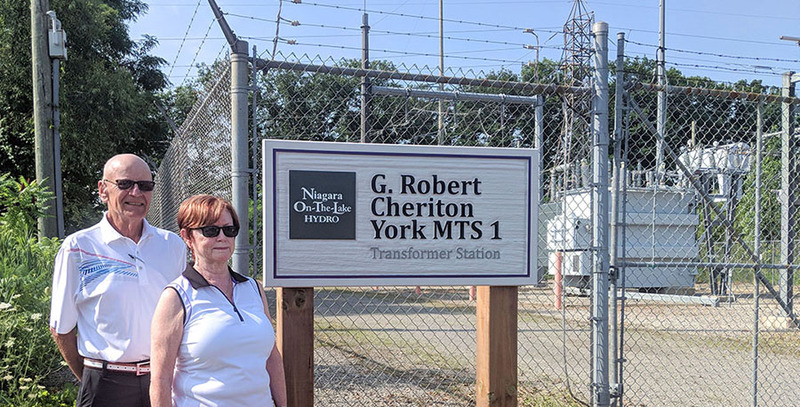 Transformer Station Renamed in Honour of Board Member Bob Cheriton - Niagara On The Lake Hydro Inc.
August 8, 2018, Niagara-on-the-Lake – Niagara-on-the-Lake Hydro Inc (NOTL Hydro) is proud to announce the renaming of our York Transformer Station to honour current Board member Robert (Bob) Cheriton; the G Robert Cheriton York MTS 1 transformer station. Bob Cheriton first became a Board member of Niagara-on-the-Lake Energy, the parent company to NOTL Hydro, on February 1, 2002. It was a turbulent time in Ontario’s electricity sector and at NOTL Hydro. Since then, the Board of Niagara-on-the-Lake Hydro developed and implemented long-term plans to invest in the local grid and to look at revenue generating opportunities for the Town of Niagara-on-the-Lake (NOTL Hydro’s sole shareholder). The Board guided the purchase and build of the two transformer stations that service Niagara-on-the-Lake and, as a result, NOTL Hydro has the lowest delivery rates in the Niagara Region and among the lowest in Ontario. Bob also served on the Board of Niagara Regional Broadband Network Ltd. (NRBN) until 2017. NOTL Energy owns 25 % of NRBN, which was established in 2004 and has become Niagara’s leader in premium high-speed fiber connectivity. Bob is also a prominent member of the NOTL community; organizing the annual Christmas parade for many years, being a long-standing a member of the Niagara-on-the-Lake Golf Club and assisting at a number of community events. In future years, the G Robert Cheriton York MTS 1 transformer station will undergo significant updates including the addition of a battery storage facility and the upgrade of the transformer to one that will have the capacity to supply the entire town of NOTL with safe and reliable electricity for another years to come. « How much would it cost Luke Skywalker to power his lightsaber in Ontario?